That's way cool Chris. Looks like there's 2 sections to that pool. Also looks like there may of been an issue with one of the subs at the end there? Yup, the pool has a large normal rectangular area, and a smaller shallow section connected to it, fun to navigate. His video came out well. That sub at the end had a broken latch, the top half came off. Most of them are built that way, so you can get at the controls and the water tight cylinder with the electronics. Neat video Chris! It must be pretty rewarding to see your Orca buzzing around like that. Pretty impressive underwater video too! Just a quick updatwe on what is happening - I got the last of the plan sheets generated (43 pages, D-size, quite a pile) and off getting a couple sets printed - one for me and one for the historical society. I printed off a set on 8-12x11 paper to check them, they are legible but the text is pretty tiny. Next step is to go get some cookies (and start the dough for this year's batch of Christmas cookies), and rest up for a bit. Then, will make a copy of the project workspace and use that one to scale down to 1:16 scale for the model. I am assuming that there will be some work to do on the drawing files in that copy, at least have to reset the scale of the parts on each page, if not go in and change some dimensions on the thinner parts. Also, I'll need to design up the version of the slew/crowd/steering engines to use the simplified valving that I came up with to accomplish the combined throttle/reverse control to replace the original version, which depends on some very complex castings in the engine block. Hi Chris, that valve adaption you came up with is very clever. I have spent quite a while looking at it and following how it works. I have noticed that because of the lack of symmetry, the pressures will tend to be tipping the valve a bit rather than pressing it down flat on the port face. The full size at least partly overcomes this by the extra weight on one end due to the casting shape. When you come to the scale design for your engines, apart from making the cylinder ports as large as practical, it might be worth seeing if you can make it a bit more symmetrical. This might mean making it a bit longer and I don't know if that will fit in the constraint of the valve chest outline, but if you see an option, it might be worth minimising the unbalanced pressure forces on the valve by making it as symmetrical as possible. I suspect that is far enough ahead to not be an immediate concern, but having these things ticking over in the subconscious is often more helpful than a last minute thought, now that you have mentioned engines. I am following every step of another great project, thank you for your effort to document it so completely. I had not thought about that part. The original, and mine, also have the steam chest around the slider full of steam, so that is acting to press the slider down with the lower pressure on the exhaust side (slightly on the steam side probably as the piston moves and the steam flows, but that would be transitory). You are right in that it would help to add more mass on the outboard end. The slew engine lays flat, where the crowd engine is 45 degrees down at the cylinder end, which will help a bit. The tough one will be the steering engine, which is vertical. Thanks for noticing that! It's probably not a problem for the slew engine, but the others it could be. Hi Chris, it's not easy to be sure how important the effect is, but more symmetrical will always lead to less problem. The problem is not the upper face, which as you say has uniform steam pressure over it, but the port face of the valve. The area connected to the exhaust is obviously at low pressure and the area of this exhaust cavity with its low pressure causes most of the force pressing the valve against the face. The steam supply port is a bit harder to tell, but I think sometimes at least it is a little lower than the steam supply, if only due to the flow through the passages, so adds a little to the force. The sealing faces are harder to analyse, but the pressure distribution is often assumed to be linear between the known pressure at the ends of the valve and the pressure in the cavities, so it tends to add to the force. Obviously the largest part of the force, the part due to the exhaust cavity being off centre, means the forces on the valve are not quite balanced as they are in a normal valve. Just worth a little thought in case the valve is easily made more symmetrical, as that would be worthwhile. I think the pressures will still press the valve against the face, bit the forces may be a bit un even, so I am not sure that a spring would be necessary, or that it would even help. It will be interesting to see what others think. I think there will be room to extend the slider a bit, think I will design it with it longer to start with. The next step on the plans is to take a copy of the 3d project, scale all the components down, then replace the innards of the slew/crowd engines with my version of the ports, so that will be a perfect time to make that change. I've started making the model-sized version (1:16) of the 3D model, and it looks like it will take a bit longer than I had hoped. Fusion HAD a prototyped way to branch a project, and let both continue on from the branch, which would have let me copy both the design and the drawings and still have the original ones. However, that preview has ended, and they have decided they did not like it, will be starting over on that functionality. They also recently said there would be a way to copy the linked drawings with a design, that never made the release last month, say they hit a problem and are rethinking the whole idea. Looks like I will have to regenerate all the drawings (all 43 pages) for the scaled-down copy of the project. At least it still lets me make a sub-folder and copy all the projects into it (no way to copy them to a top-level folder, but that is no big deal). Going to be another week or so before any metal cutting starts. Keep that popcorn warm, things will continue! I have all the views for the model-sized version of the Marion shovel laid out, still need to add the dimensions to everything. In order to get started cutting metal (finally!) I am going to work on that in the background, while starting work on the dipper bucket. That should make a nice piece to have sitting with the parts as they get made. The bucket shell was a large casting in the original, I think that I am going to make a wood form and bend some sheet copper over it to make the shell. Or maybe some annealed brass bar? Have to make a test, see if the brass will take the bends or not. The shell is 5/32" thick, seems like the brass would take a tight bend that thin (probably in a couple of annealing steps), but if not I know the copper will do it. Oh, and for those of you who know me, you know I can't just be working on one project at a time! I've had this one on the back burner for a while, finally got enough knowledge put together to attempt it: another RC submarine project, this time it is another 'biologic' sub, a green sea turtle! I got the idea from one of the Nature episodes on PBS, where they used remote operated animals with cameras in the eyes to do research on animals in the wild. One of them was a sea turtle that swam around with dolphins and such, it made me think that something simaler would be a really fun model. So, I learned a bit more about moldmaking and the newer rubber compounds for flexible flippers/etc, and made some wire-controlled animitronic prototypes. So far I have the shell and head carved up from wood, still getting that sealed up and smoothed out, and just cut the blanks for the flippers. The head and tail will flex side to side as it steers, the flippers will flex up/down to act as dive planes, and there will be a pair of propellers in kort nozzles set back beside the tail for propulsion. Here is a picture of the parts so far. 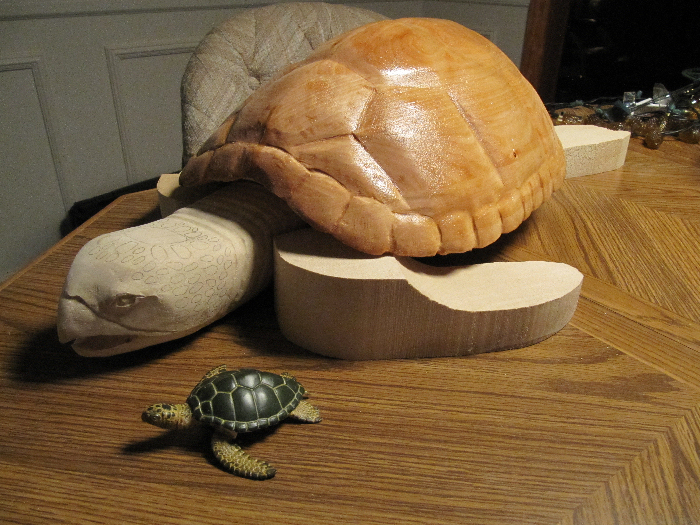 In front is the small plastic turtle I found at the zoo shop this past summer, used it as well as photos for the proportions of the model. Now, back to carving out the form for the Marion bucket! Chris.............you definitely have more hours in your day than the rest of us! It's going to be fun to see that "bad boy" in operation. Stay warm back there............looks ugly on the news! Oh, are you guys still back in that silly alternate universe with only 24 hours in a day?! We got another 4 or 6 inches of snow overnight, more coming tonight. Its good to be retired so I can pick when I go out! A guy I know lives near Buffalo where the lake effect snow comes off of Lake Erie, they regularly get snow by the foot whenever the wind is blowing from the west, which it usually is. Bad Behavior has blocked 16543 access attempts in the last 7 days.